Finding the right bat size is not as simple as looking at a bat size chart. Bat size charts fail to account for the swing weight of a bat or the skill of a player. Additionally, bat size charts often don’t differentiate between fastpitch, youth barrel, BBCOR and big barrel bats. Nor do they account for the different weight drops in bats. With that said, we can extract some good information from bat size charts. We discuss in details below. Another way to determine the right bat size is dependent upon the typical pitch speed seen and the size of the player. This infographic takes you through a mathmatical formula that determines the right bat weight size. As we discuss below concerning bat size charts, there is good evidence any chart forcing bat size strictly based upon the height and weight of a player is incorrect. Skill level and bat weight load play significant parts in the actual right bat size. Charts are incapable of picking up that nuance. With that said, we do think bat size charts can get you closer to the right size. We suggest you use the charts on the page as a starting point and then, after considering the write up below, choose your best bat weight. See this article too. This isn’t due to a lack of trying. There are thousands of bat charts floating around the internet with every manufacturer, vendor and blogger using their own. Even academia got involved. Although still deficient (which we discuss below) it is our favorite bat size chart. This table, they claimed, optimized the amount of swing speed per given bat weight to maximize batted ball distance based. The factors considered were height, weight and the player’s skill level. It sounded smart, because it was. While the bat correctly utilizes the league of the player to determine skill, it fails to account for the dramatic variance in skill level among those players in the same league. Same sizes and ages have little to say of skill variation within an age group. This chart says otherwise. The chart also fails to recognize that a bat’s total weight is NOT the bat’s swing weight. As we discuss elsewhere, the swing weight of a bat correlates with it’s total weight. But they are far from one and the same. In reality, a bat’s swing weight is a function of balance point and bat length. 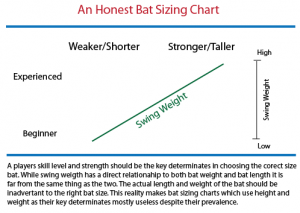 The chart also fails to consider that the actual weight of bats is different than a bat’s stated weight. In other words, all 32 ounces, for example, are not the same total weight. Much to the surprise of many, there are actually THREE different weights for every bat you pick up. They are the Stated Weight, the Actual Weight and the Swing Weight. The stated weight is what the manufacture claims the bat should weigh. The Actual weight is what the bat actually weighs (which is often not the stated weight). The swing weight is a measurement of how much power it takes to swing the bat. From a hitting performance perspective, the only thing that matters is swing weight. Yet, in bewildering fashion, the general public doesn’t have access to swing weights. Instead, we are left to consider the stated weight of the bat which is often inaccurate from the actual weight—neither of which would give you the swing weight. As such, for example, a 30/27 BBCOR bat of any particular bat model may not have the same total weight of another 30/27 BBCOR. 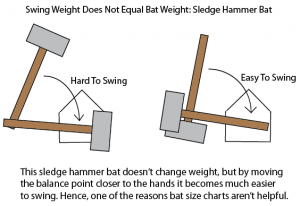 Even if the two bats did have the same total weight, they may not have the same swing weight. Due, in large measure, to the distribution of the bat’s total weight along its length. In other words, not only is it likely that two different model bats with the same stated weight actually weigh differently, but how their weight is distributed along the length of the barrel makes the two bats swing weights often remarkably different. If that concept of swing weight and total weight needs more clarification, imagine swinging a sledge hammer with the hammer portion in your hands with the handle as your bat. The sledge, you could imagine, swings rather easily. Now turn the imaginary sledge hammer around and swing by holding on the handle. Such a feat is much more difficult. The sledge hammer didn’t change it’s total weight at all, but it did change it’s swing weight. That swing weight changed because you moved the balance point of the object from more towards your hands to more towards the end. As such, the swing weight of the bat changed by simply changing the distribution of the weight along its axis. So Where Do I Find Swing Weight? Sadly, at the moment, no manufacturer is actively publishing their swing weights (often referred to as as moment of inertia or M.O.I.). The only way that we know of to calculate the actual swing weight of your bat is by this calculator here. Once you have a feel for the swing weight of your bat then you can begin comparing other bats swing weight. We use the chart Terry Bahills put together as a starting point ONLY (this is the chart above). This at least puts us in the range of the average size weight of the bat which could work for any given player. Then, we use information on this bat review blog to determine if bats with that particular stated weight have an endload, balanced or hand loaded feel. We then, like the good old days, find a place to hit with these bats. There is simply no way to tell if the bat is the right fit until the player has hit with it. If we can’t find a demo house then we try and find friends or teammates who have the bats. Some companies are also offering 30 day Love It Or Return it type polices which give us some liberty to test them out. We are willing to take advantage of those offers. Once we’ve gone through that song and dance, we are ready to make a decision. Unfortunately, the market’s current setup fails to provide swing weights before asking for cash from the buyer. We are left to our own devices: measuring our own swing weights, reading endless bat reviews and finding clever ways to use a bat before buying it. It’s a battle no doubt, but otherwise it would hardly be fun.